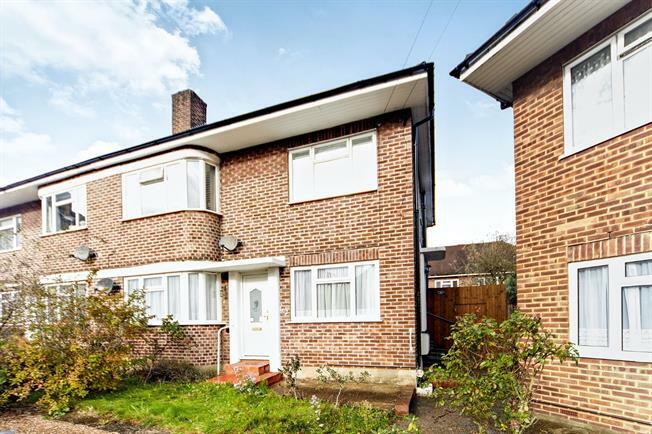 2 Bedroom Maisonette For Sale in Croydon for Asking Price £320,000. A popular first floor maisonette which is situated in a quiet cul de sac location yet within easy access of the main Wickham Road for local shops and bus services. Comprises of two double bedrooms, a spacious lounge and modern fitted kitchen/breakfast room with integrated oven, hob and filter hood. The property also features a white bathroom suite, double glazing and gas fired central heating. Replacement fascias, soffits and guttering. To the side of the property is a private garden of approximately 40 ft.
Stairs to the first floor. Access to the loft. Picture rail. Double glazed bay window to the front. Radiator within a unit. Two wall light points. Double glazed window to the side and rear. Fitted with base and wall mounted units with tiling to work surface surrounds. Inset stainless steel sink unit with mixer tap. Integrated gas hob with stainless canopy style filter hood and oven. Wall mounted boiler. Recess for washing machine, dishwasher and fridge/freezer. Two radiators. Coved ceiling. Inset lighting. Laminate wood flooring. Double glazed window. Fitted wardrobe to one wall. Radiator. Double glazed frosted window to the side. Panel enclosed bath with mixer tap and shower attachment. Vanity wash hand basin with unit. Low level flush w.c. Heated chrome towel rail. Localised wall tiling. Extractor fan. Ceramic tiled floor. Located to the side of the property and being approximately 40 ft with side access. Raised decked patio area and lawn. Shrub borders. Shed.